Another Ebenezer but this time "steam powered". Rob said "The idea to build the model was inspired by seeing Pete Smarts rubber powered version at Impington. Its on You Tube flying! So I thought I would build an Ebenezer version." 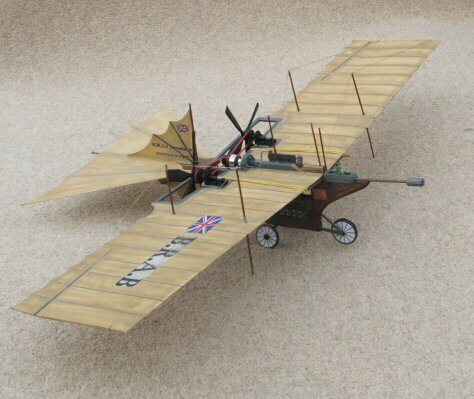 The model is powered by a Robotbirds 10 gram motor with pulleys driving the K&P props. 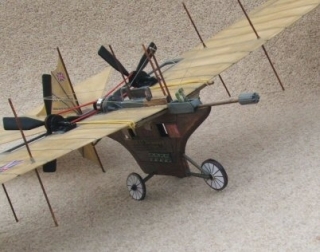 Samuel Henson and John Stringfellow applied for a patent for their "aerial steam carriage" in 1842. After seeing a report of this in the press, it caught the interest of Prince Albert the Prince Consort. After witnessing a demonstration of one of Stringfellows large models of the craft, he immediately saw the military potential of such a craft. Using his considerable influence he got the British army to buy the Henson patent and set up a secret base on Salisbury Plain (known as "aerial engineering research area fifty one! Area 51 for short) to undertake to develop a full size craft. 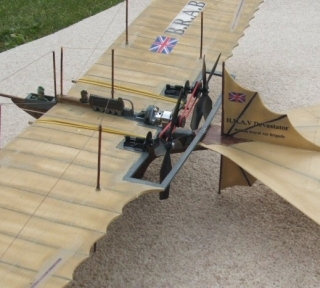 By 1845 the first viable aerial vessel had flown a distance of three quarters of a mile ,by 1849 after a great deal of development of the engine and fuel system and the invention by Stringfellow of wing warping for lateral control the first class of HMAV (Her Majesty's air vessel) was constructed. Known as the "devastator" class after the first vessel of the class, these craft could reach a speed of 90 mph, a height of 2000 feet and had a range of 100 miles. They could carry 8 "bombshells" of either high explosive or grape design. This had all been developed in great secrecy at A.E.R.A 51. Any locals who saw the craft in flight were convinced the army was in league with the devil! This was something the army was keen to encourage as it kept people away from the site. When the Crimean war broke out in 1854, HMAV devastator was sent out in secret, much to the chagrin of the army commander Lord Raglan, he had no faith in any newfangled ideas and considered that dropping "bombshells" on his opponents was downright unsporting! The "Devastator" was commanded by a major Lewis Nolan, an ex cavalry officer who had become a great proponent for the use of aerial vessels in warfare and was later to write a famous text book on the subject. Setting up his base near the Belbec river 15 miles from Sevastopol and Balaclava Nolan assembled and made ready the "Devastator". On the morning of the 25th October 1854 after hearing the sound of cannon from the direction of Balaclava. Nolan took off in the Devastator, to fly to the sound of the guns. He had no orders from Lord Raglan to do this ,but due to the influence of the Prince Consort he had more or less been given a free hand in his aerial operations. Arriving over the battlefield of Balaclava, he observed the Light Brigade under Lord Cardigan, commencing to charge down the north valley at a battery of Russian guns. Taking in the situation at a glance ,and so as not to upset their horses, he flew the "Devastator" down the valley in advance of the light brigade he then dropped four high explosive "bombshells" amongst the Russian guns. The Russian gunners who had never seen or even heard of such a craft immediately ran away in terror, allowing the Light Brigade to pass through them virtually unscathed. Seeing this Lord Lucan ordered the heavy brigade to charge down the valley and support the light brigade, they were supported by the French "Chasseurs D Afrique" who cleared the Russian forces from the Fedioukine heights. As the light brigade was now almost into the supporting Russian forces, who had been drawn up behind the guns, Nolan undertook another attack run. Although he only had his remaining four "bombshells" the effect was to panic the entire Russian force into a retreat, which with the arrival of the British cavalry turned into a rout. The British captured all the Russian guns and around 6500 prisoners including the Russian commander and his staff. By an ironic twist of fate, although the Light Brigade suffered few casualties (6 dead 27 wounded) one of the first to die had been Lord Cardigan. As he was riding well in advance of his brigade he was caught in the blast of the last "bombshell" to fall on the Russian battery and was killed instantly by a splinter from it. Thus ended the battle of Balaclava! It was a stunning victory for the allies. The following day Nolan took the "devastator" to Sevastopol and bombed the city, although he caused little damage and few casualties (10 militry,32 civilian) this so dismayed the Russian commander that he immediately surrendered the city to lord raglan. By November 11 1854 the Russians had negotiated an armistice and the Crimean war was over. In 1861 Major Nolan was promoted to Major-General to become head of the "Royal Victorian Aerial Force". The deployment of 20 Devastator class air vessels to Canada later that year was instrumental in halting an American invasion and kept the United Kingdom out of the American civil war. Nolan was later to have his reputation sullied when in 1879 , operating from a base near Rorkes Drift in Natal Province with a force of 10 "Pulverisor" class aerial vessels he bombed the kraal of King Cetshwayo near Isandlwana, killing nearly 4000 Zulus most of them women and children. This act ended the Anglo/Zulu war before it had even begun. but this operation was seen to be morally ambiguous at best and genocide at worst. Ever after he was known as "Bomber Nolan". 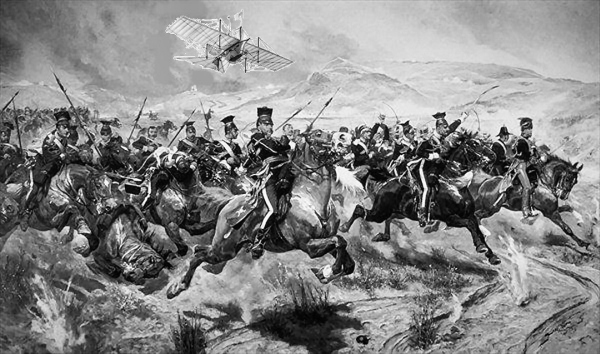 Nevertheless, the flight of the "Devastator" and the charge of the Light Brigade has gone down in the annals of British military history as one of the most complete victories ever achieved by the British armed forces.